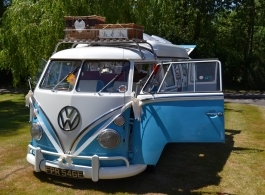 Classic 1967 Splitscreen Campervan for weddings in Bristol. A beautiful 1960's deluxe version Campervan in Blue and White with a White pop up roof and matching canopy. The interior has Blue & White vinyl seats and Cream headlining throughout, Black & White tiled flooring and original wooden furniture. This Campervan is a great choice of wedding vehicle for both bride & groom and is also a unique and fun way of transporting bridesmaids if required. A bottle of bubbly + 2 vintage glases are supplied as standard for all full wedding bookings.